A new, limited golden anniversary edition in honor of 50 wonderful years, including rare bonus content. Happy birthday, Very Hungry Caterpillar! The Very Hungry Caterpillar has been crawling its way into kids' hearts for 50 years, and what better way to celebrate than by giving him a brand new cocoon! 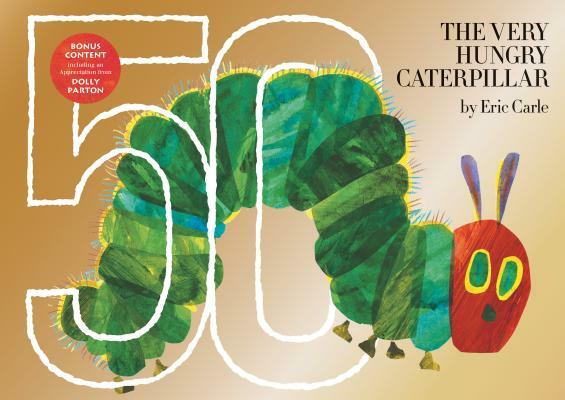 With a beautiful golden anniversary jacket (with an oversized "50" logo), along with a new introduction letter from Eric Carle himself, this anniversary edition will be sure to delight Caterpillar fans of all ages. Bonus content features an appreciation by prominent children's literacy advocate Dolly Parton, as well as an essay on the history and significance of the Caterpillar, including rare images of the original sketches and historic photos. Dolly Parton is one of the biggest country music stars and one of the bestselling recording artists of all time. Known as the "Queen of Country Music,” she has sold more than 100 million records. She has starred in a wide array of movies and has won eight Grammys and been nominated for two Academy Awards, five Golden Globes, and an Emmy.